Javier has two guises. As a stand up he plays the biggest clubs in the UK� delighting audiences with well crafted jokes and a very likeable stage persona. As �The Card Ninja� he plays cabaret clubs, private functions, corporate events and festivals � dazzling with his displays of cards as weapons! Before coming to the UK in 2010 Javier spent 4 years working as a professional comedian in New Zealand. 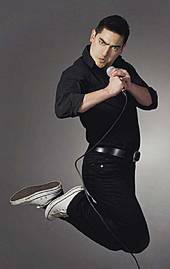 After winning the 2007 �So You Think You�re Funny� competition in Christchurch, he played and headlined in some of the biggest clubs in NZ and Melbourne, on a host of television shows, and was a core member of New Zealand�s longest running comedy show: Scared Scriptless.